Ok. Forget everything I said last week about noodle soup. Ok, not everything. The sentiment still holds, I suppose. The places and soups I mentioned still have their merits based mostly in their convenience and comfort. 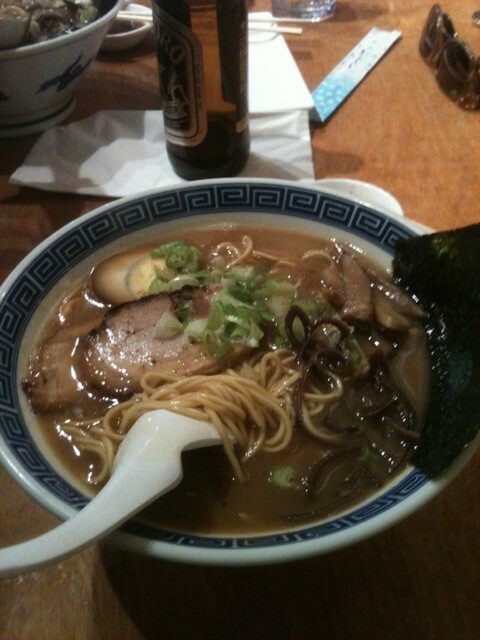 But everything has kind of changed thanks to a revelatory bowl of ramen (and thanks to Mr. & Mrs. Kitchen Monkey for finding this joint) I had the other day in Alphabet City, New York, New York. First, disregard the image that first popped in your mind when you read the word “ramen.” While I’ve had my share of revelations while enjoying a bowl of 10/$1 Top Ramen, this bears no resemblance to the college dorm-room staple. No, this is what I have to imagine is a fairly traditional Japanese ramen. Let me try to set the scene. I’ve been in the car for 4 hours, on a drive up to New York from DC. I’m still reeling from the head cold that’s plagued me for several days now. It’s closing in on 2:30, and the only thing I’ve eaten since an early breakfast of cold spaghetti is a sack of peanut m&m’s. My fellow weary travelers and I park the car near the corner of 5th St and Avenue B and make our way to Minca Ramen Factory — a tiny hole-in-the-wall specializing in ramen. 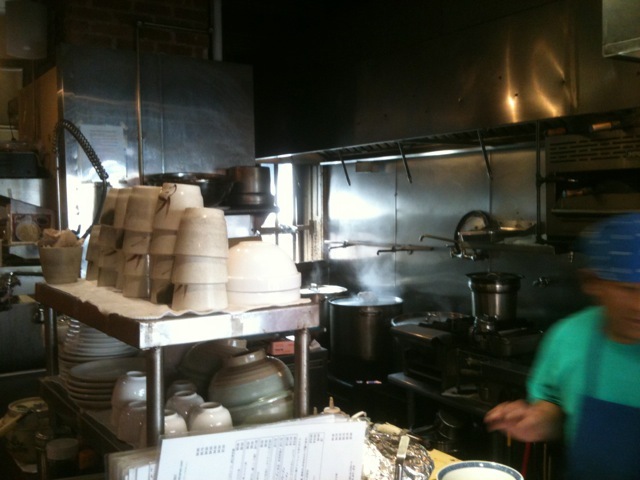 They’ve got 4 tables, a bar around the exposed kitchen, and 3-4 chefs/servers. 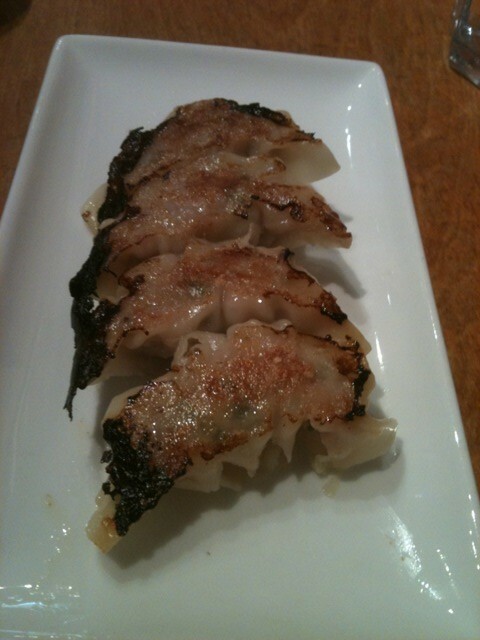 After a first round of pork gyoza, I’m ready to approach the fairly simple menu. Pick a broth and a noodle and you’re done. 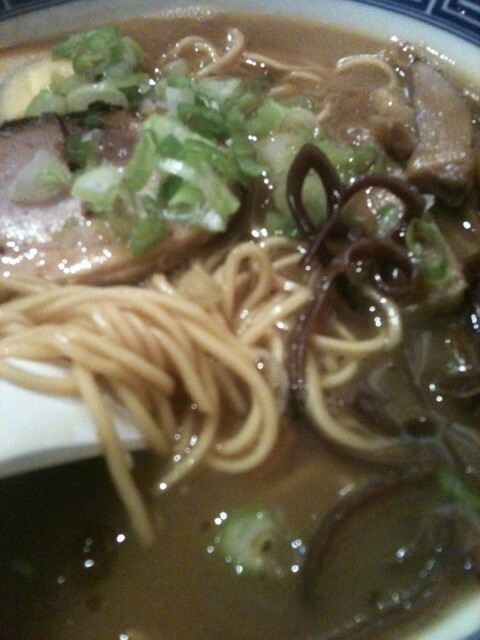 I settle in on pork broth, shoyu flavor with thin noodles. Minutes later I am presented with anodyne in a bowl. The pork. Oh lord. I guess in a pinch, I’d say this was my favorite part; but, again still debatable. On the menu it’s described as “Pork Charsu.” Some research reveals this is either belly, shoulder, or cheek (I’m guessing belly, or maybe loin, in this case) that’s slow braised in a variety of Asian flavorings. I also saw the chefs take a blow-torch to the pieces to get some char on them. To call the resulting slices (and a tip to the wise, one serving comes with just 2 slices, I’d suggest ordering extra) fall apart tender is an understatement. Upon contact with a chop stick, the slices splintered into smaller pieces that became distributed throughout the bowl, providing endless enjoyment. Again, the flavor was predominantly meaty and porky. Kind of a solid form of the broth. And then the egg. Each bowl comes with half of a hard-boiled egg. From what I can tell, they boil and half the eggs, and then leave them to soak in soy sauce and probably some other stuff. 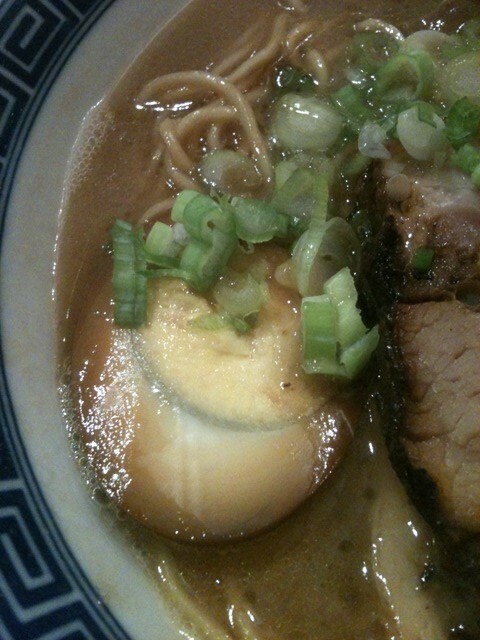 Then submerged in the broth for as long as it was, the egg, too, was, well, porky. A couple of folks at the table ordered vegetarian, but also got the egg, so I asked if it was as porky as mine, and, alas, it was not. Also topping the bowl were three or four varieties of fungi (“wild vegetables” reads the menu.) I would be hard-pressed to actually identify any of these, but their different flavors and textures were ideal accompaniments to the whole situation. Chewy and full of umami. Lastly, the noodles. The menu provides a variety of choices, though with each broth selection, they recommend one or two particular choices. The options are thin, thick (not that much thicker than the thin,) wavy wheat, whole wheat, and bean. (By the way, the menu also allows you to substitute chicken for pork.) I opted for thin (one of the recommendations with the pork shoyu broth.) The noodles are just perfect. Just chewy enough. Soaking up the broth and other flavors in the bowl, but also having a distinct wheat flavor of their own. I didn’t actually see them making an noodles in the kitchen, but with the name of the place, I have to assume they are made in house. As is often the case with me, it’s more than the food itself that factors into my enjoyment of any meal. It’s about context and circumstance, too. In this case, though, I’m pretty sure no matter what the circumstances, this bowl of ramen was one of those all-time great food experiences that I hope to recreate over and over. Aw man…I’ve had a few dreams about that bowl of ramen. You are spot on on the broth. It’s like something between a soup stock and drinking straight, delicious pork gravy.